I love it when The Secret Recipe Club challenge arrives in my inbox! Even when I am very busy and think I might not have time to get it all done for the month. This month I was assigned Melissa’s Cuisine and I spent a morning reading through her blog. Melissa’s husband Mike is certainly very lucky that she enjoys spending so much time in the kitchen! I once again decided to make a pasta dish. This is a meal I can create over the weekend and both Dave and I can enjoy it on a Sunday night when we come back from our weekly wine tasting. As we have a great selection of exotic tomatoes at the moment, this recipe for pasta with roasted tomatoes stood out as the one I wanted to make. I printed the recipe out the day after we got our assignments, and again, life got in the way of blogging. We went away for a long weekend, and I did not want to leave it to the Sunday night before our reveal date to make this dish. I went home early one day last week as we had no electricity at work, and used the time I had spare to make supper. Everything was ready to go when Dave got home from gym which was great. 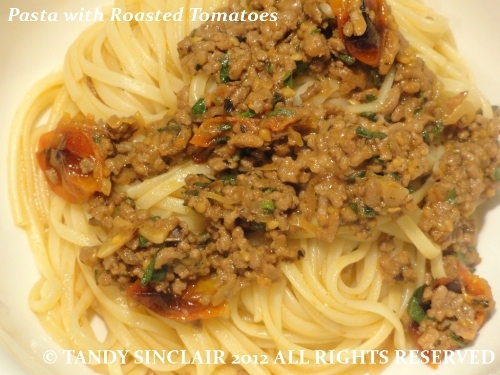 I have adapted the recipe as we don’t get ground turkey in South Africa and I can say it was lovely. I am submitting this recipe to Presto Pasta Nights, which is being hosted this week by Simona of Briciole. What a great dish, Tandy! I cannot grow tomatoes either. Fortunately, there are enough farmers around me who do it well. I love roasting tomatoes: they fill the kitchen with a great smell. Thank you for contributing to Presto Pasta Nights. MMM..a tasty & easy recipe to make! Yum yum yum! So much flavour in here! What an excellent evening’s meal, Tandy.. really, really great! Mmm, I bet this is delicious! Everything roasted tomato (and sun-dried tomato…okay, maybe just “tomato” in general…) is so good and tastes so rich and summery. I love sun dried tomatoes baked into bread! I will post one soon! Ohh, I am looking forward to this! Yum! Looks superb! I love the secret recipe club idea! I could eat roasted tomatoes like candy! Roasted tomatoes have such a great flavor! You definitely chose an awesome dish. Roasting the tomatoes makes them so sweet and yummy. I also find it hard to find ground turkey in Hong Kong or even just turkey as a matter of fact here. Love roasted tomatoes and this looks like a wonderful dinner. What a yummy looking pasta dish! Great SRC pick. I think this recipe could be absolutely splendid! Yum! Tandy does it again with a delicious pasta dish! This sounds so delicious~I can practically smell it cooking on the stove. This is definitely going on my “must make” list! Good inspiration! I have some zucchini I might roast with the tomatoes and throw it in as well. I love using roasted tomatoes in a sauce – everything comes together so quickly. Great SRC pick! OH, pasta is my weak spot! YUM! Yummy. This looks really good, Tandy. I love the cherry tomatoes with balsamic vinegar. Yum! Mmm, roasting tomatoes really does bring out a wonderful flavour!